What is THIS, you might wonder? Well, I am trying my hand at semmelwraps…… To explain: Carnival season is approaching, there are tacky costumes for kids in Rome shop windows and bits of confetti here and there on the wet sidewalks. The bakeries have frappe, bits of flat deep-fried pastry dusted with icing sugar. 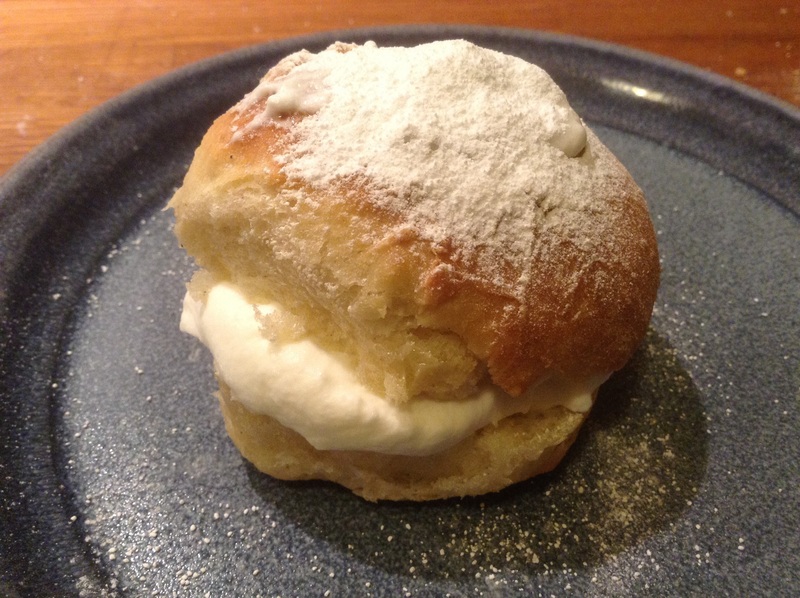 It hailed here this morning, brrr….. and I really fancied fastelavnsboller, which are Norwegian yeasted Shrovetide cardamom cream-filled buns, so time to bake! In Norway we have fastelavnsboller to mark the last Sunday before Lent, which is actually in two weeks, but I wanted these now. 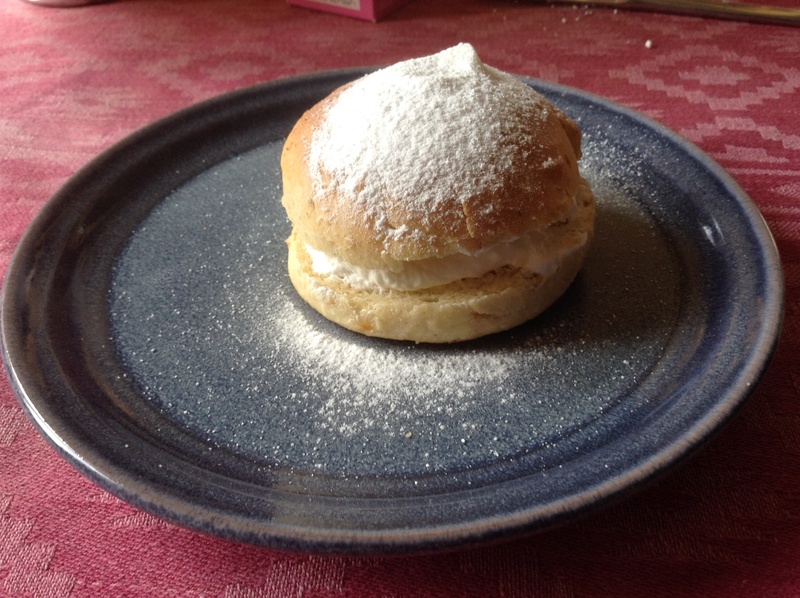 Last year, mine looked like this: In Sweden these are called semlor and are sometimes also filled with some marzipan or almond mass. Lovely. Only this time I thought I might try the super-trendy semmelwrap, the 2015 Swedish version of cronut-mania, invented by a Stockholm bakery. You make your sweet yeasted dough, roll it out like a tortilla, an then stuff it with almond mass and whipped cream, and make a wrap. See Baka semmelwraps for what it SHOULD look like, and recipe in Swedish. Very, very hip in Sweden right now. I used a basic sweet yeast dough for the buns, and optimistically rolled out two of the buns to see if I could make a semmelwrap. How bad could it be? This makes 14-15 buns, depending on the size. Or 13 buns and two wraps. Knock the dough back. 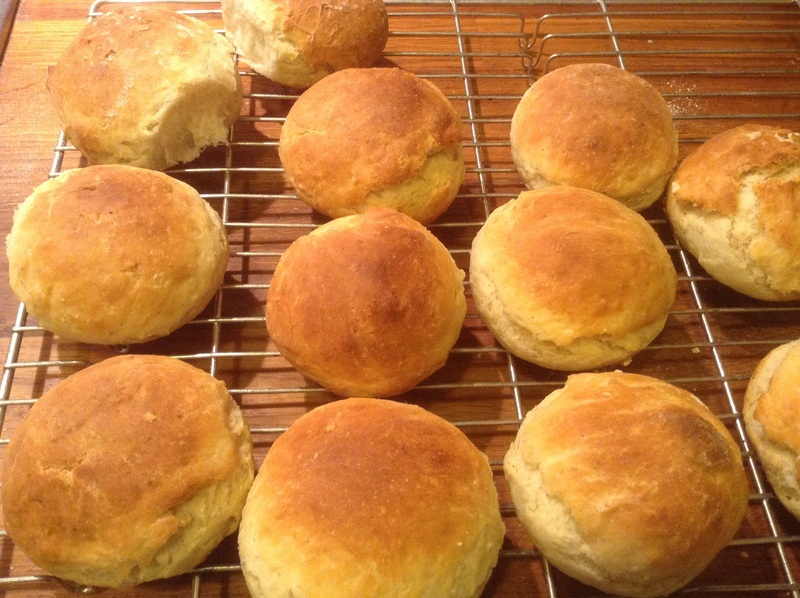 Divide it into 14-15 pieces, and roll these out to round buns, roughly the same size. Leave to rise on parchment paper on a baking tray, covered with a tea towel. Leave to rise until it doubles, 20-30 min or so. You can glaze them with beaten egg if you like before baking, but I skipped that this time. Bake buns at 240ºC on the middle rack for 10-12 minutes. Let the buns cool on a rack. When buns / wraps are cool (otherwise the cream goes runny): whip the cream with the vanilla and sugar. Slice the buns in half. Spoon a generous blob of whipped cream on the bases, then replace each bun top carefully. Sift over icing sugar, and serve. It can be messy but is delicious! WRAPS: Bake at 240ºC on the middle rack for 5-6 minutes. Let the wraps cool on a rack. (Note: the Swedish video warns against over-baking, and recommends 3 min at 240C. Mine might be a bit thick, I baked them 8 minutes.) 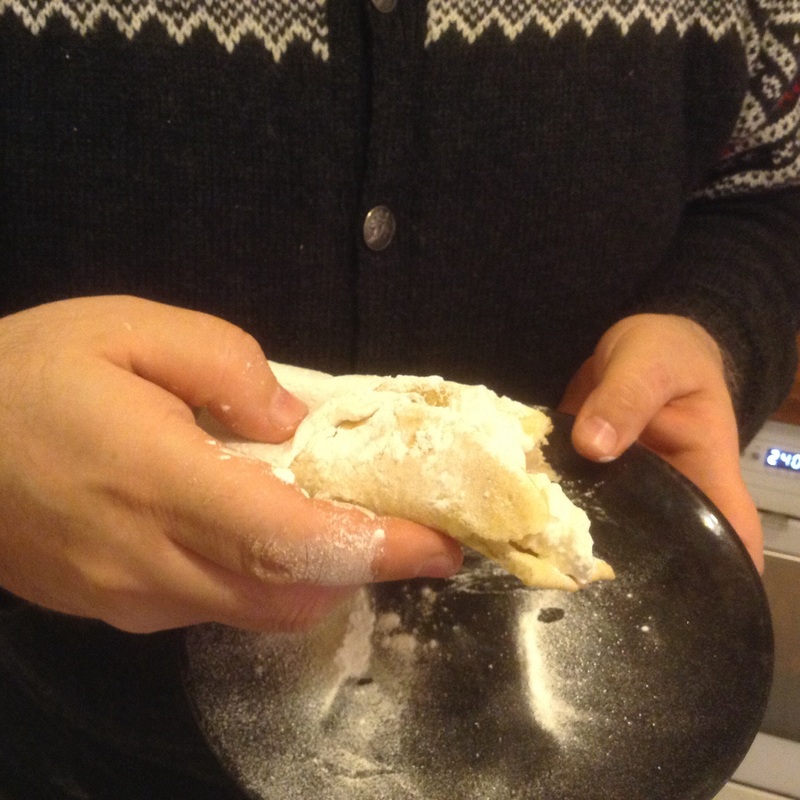 For the two test wraps, we excavated some leftover marzipan (35 grammes or so) and crumbled that in the two wraps. Add some whipped cream, and dust with icing sugar. Try to fold. Discover that yes, your baked wraps are a little too thick….. mine were like thin naan, but they really need to be rolled quite thin. One was foldable, one just cracked. Both were delicious though! 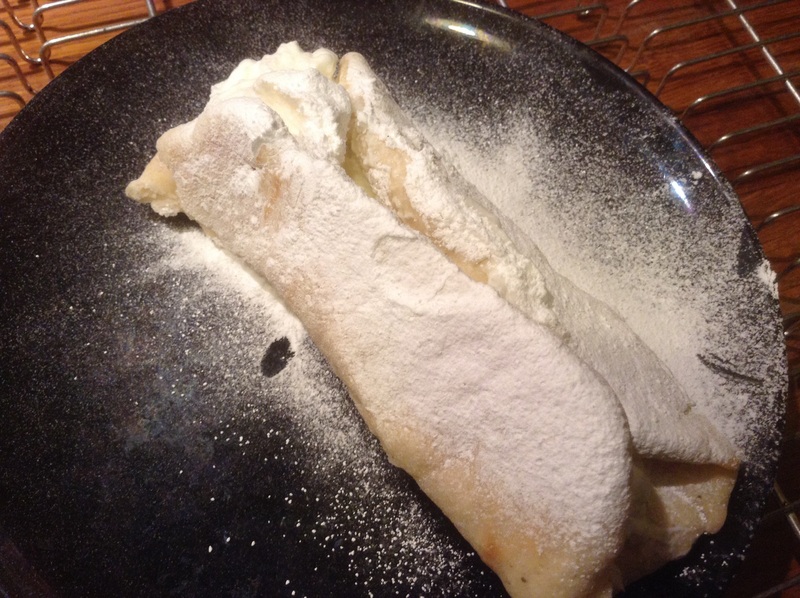 This entry was posted in baking, food and tagged cardamom, Norwegian, Swedish, yeasted on February 1, 2015 by krumkaker. 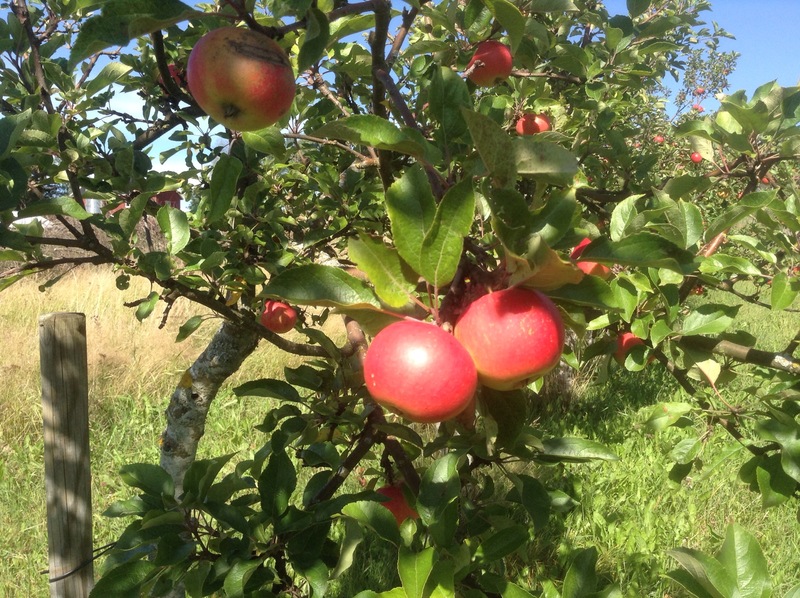 Late August in Norway, and the plums are in season. So are apple cakes: we have had several this week while visiting relatives for coffee. Endless cups of filter coffee, with freshly baked apple cake. All slighly different, but delicious. Tart apple slices in a light cake base, scented with cinnamon – just wonderful. Today we needed a simple cake, and yes: it was an apple cake. It is the birthday of my mother, so various more elaborate cakes have also been baked, but this was the extra cake for any neighbours who might stop by. Norwegian birthday celebrations often have several cakes. 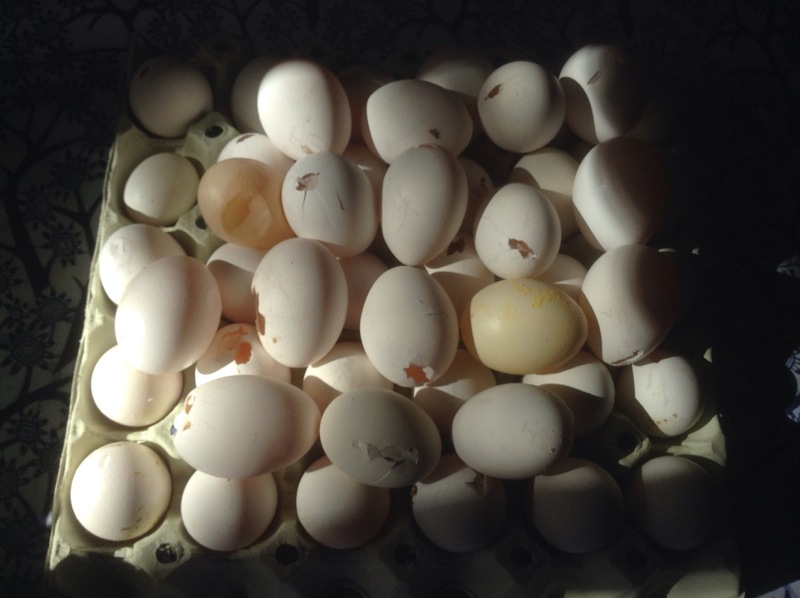 A tray of klink egg: slightly damaged eggs, or small ones. Our neighbour has hens, and we were over there for coffee Wednesday. On the way home, they handed us a tray of eggs – knowing we were celebrating today, and would be baking a lot. Perfectly good for baking, if you recalculate the egg size. An average egg in Norwegian recipes is 60g. Here is the recipe I was requested to bake. I can easily see which cakes my mother likes, as she annotates them and also includes calculations for baking the cake in large and small baking forms. As you can see, this is adapted from a Swedish apple cake competition winner, and is very good. Some measurements are given in dl, desilitre: it is a volume measurement, one desilitre is 100 millitres. Whisk eggs and sugar to a light airy mass. Melt butter, cool. Measure flour and baking powder, add that to eggs. Add cooled butter. Whisk slightly. Peel and core apples, slice into boats. Pour batter into prepared 26 cm springform (baking parchment on base, a little butter to grease sides) and press the apple boats in. Bake 45-50 min or so at 175C until nicely golden. Cool. When ready to serve, dust with cinnamon. Filter coffee on the side is optional. 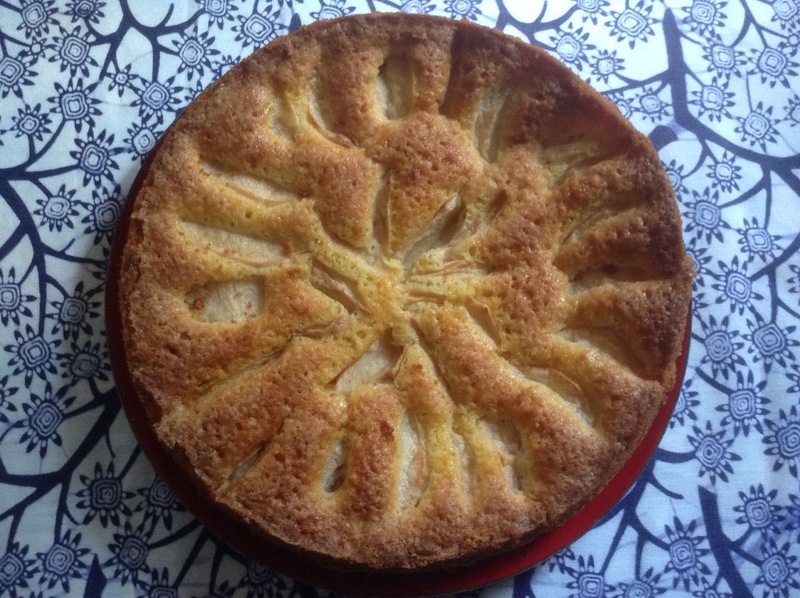 There you are, a proper Swedish apple cake, slightly adapted from the original. Best the day it is baked, so I will bring this to Fiesta Friday as a rustic Scandinavian taste of summer. Enjoy! PS for those who enjoy radio, this is really funny: The Cold Swedish Winter, on BBC Radio 4. It is a sitcom about a British comedian who moves to Sweden. 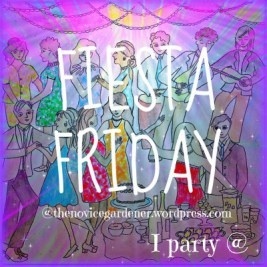 This entry was posted in baking, food, fruit and tagged apples, cake, Fiesta Friday, Swedish on August 29, 2014 by krumkaker. Another hot muggy day. We have had gorgeous cool mornings with sun and then rain every afternoon for some days now. Still bearable to sleep at night though, which is wonderful. We had restocked after the weekend away, and the fridge is still crammed with prosciutto and mozzarella di bufala, and a multitude of brown paper bags containing figs, cherries, peaches, pears, lemons, melons. It’s getting close to the no-cook season, but since the oven was on for baking bread, I made a quick rulltårta (a rolled cake, what the Swedish call a Swiss roll). Normally I’d use a very simple recipe with eggs, sugar, flour and a pinch of baking powder, but I thought this Swedish recipe with milk looked interesting. Adapted slightly from Cupcakesfluffan: En helt vanlig rulltårta (a blog well worth reading if you understand Swedish). It was a lovely fluffy cake, with a good flavour, even though I skimped on the sugar at the end and the cake stuck to the tea towel…..
Preheat oven to 225C. Prepare an oven try with a sheet of baking paper. Whisk eggs and sugar until light and airy, then add milk. Add the rest. Spread the batter carefully onto the baking paper-covered tray and bake 7-8 minutes in the middle of the oven until it is a nice light golden colour. 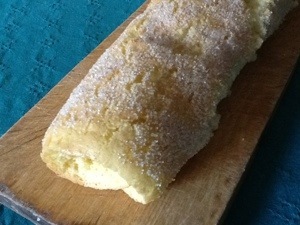 While the cake is baking, spread a tea towel on the counter and sprinkle with some sugar. You could also use another sheet of baking paper. The sugar is there to stop the cake from sticking to the tea towel. Working quickly, invert the cake onto the tea towel so the golden top is now face down, on the sugared tea towel. Peel off the baking paper quickly but gently. 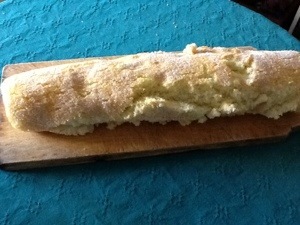 Spread on the jam of your choice, and roll the cake together from the long side so you get a nice long rolled cake. Use the tea towel to support the cake while rolling. Let the cake cool a bit before slicing. Notes: I did not use enough sugar for the rolling stage and this cake really adhered to the base, so it cracked a bit when rolling. My fault entirely; must increase sugar next time. Lovely taste though. Some recipes recommend rolling at once, some recommend letting the cake cool a bit before adding jam and rolling. Both seem to work. Any of you have a preference for rolling warm or roling cool? 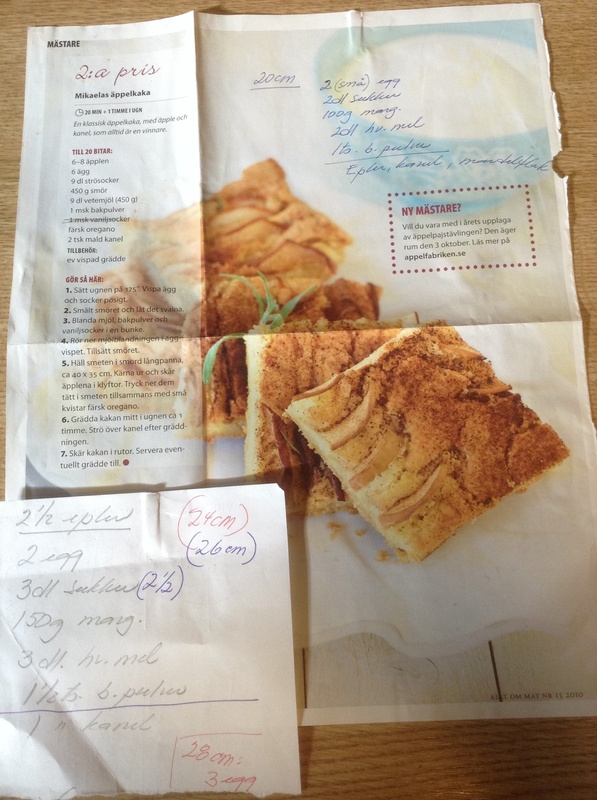 This entry was posted in baking, food and tagged cake, jam, Swedish on July 11, 2013 by krumkaker.